Uncover the real Mexico. A place where vivid art, remarkable cuisine and cultural tradition wait at every turn. Spark your creativity in dynamic Oaxaca. Walk in the footsteps of the all-conquering Aztecs. Eat sizzling street food to rival the world’s best cuisine. And discover ancient legends hidden deep in the jungle. Walk in the footsteps of Mexico’s most revered artists and writers. Uncover Mayan secrets in ancient jungleswathed cities. Drift down the Grijalva River to the geological wonder, Sumidero Canyon. Taste Mexico’s “drink of the gods”. Arrive into Mexico City, the most populous metropolis beyond Asia. Mexico’s capital is a throbbing place of wide boulevards, palm trees, street food, murals, and intriguing architecture, old and new. 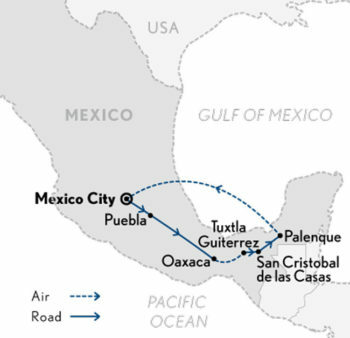 Journey to Teotihuacán and, accompanied by your private guide, uncover the secrets of this vast complex of pre-Aztec ruins, once one of the largest cities in the Americas. Scale the stone steps to the top of the Pyramids of the Sun and Moon for sweeping views across the “birthplace of the gods”. Back in the capital, embark on a guided walking discovery starting in the bustling Zócalo, the city’s main square. Unpeel layers of history as you explore the baroque Metropolitan Cathedral, Diego Rivera’s murals in the Palacio Nacional and treasures of the Palacio de Bellas Artes (B). Choose what moves you. Head to Mexico City’s southern neighbourhoods that still feel like small villages. Soak up the vibe in Coyoacán’s artisanal market and walk the maze of tree-lined cobblestone streets in the footsteps of Mexico’s most revered artists and writers, including a visit to Frida Kahlo’s Casa Azul and Studio Diego Rivera. Or accompanied by your local expert, learn about Luis Barragan, one of the most influential architects of Mexican modernity and discover some of the city’s fascinating architectural styles (B). Journey south to the UNESCO World Heritage City of Puebla, chock full of colonial treasures, café-lined squares and vibrant arts and crafts. Join your personal guide and marvel at the splendour of elegant buildings clad in shimmering azulejos, tin-glazed ceramic tiles. Gaze skyward at the majestic Catedral de Puebla and wealth of beautiful churches around the bustling zócalo, the centre of the old city. When hunger calls, Puebla’s signature mole poblano will not disappoint (B). Travel further south to Oaxaca, the creative capital of Mexico. Navigate the vibrant city with its imposing Baroque churches, art galleries and shady plazas - perfect for peoplewatching. Dare to eat like a local and feast on grasshoppers, agave worms and ants. Or, play it safe with the equally rewarding grilled empanadas and spicy hot chocolate (B). Spark your creativity, your way. Seek colourful crafts in Zaachila’s local markets before visiting the village homes of skilled artisans to learn age-old techniques, such as knife-making, ceramics and backstrap loom weaving. Or, treat your taste buds to a culinary adventure, led by chef explore their favourite merchants in the local market, before joining him in the kitchen to prepare your feast. Then, enjoy your creation the Oaxacan way – served with rare varieties of mescal (B,L). Board your flight for Tuxtla Gutierrez. Drift down the Grijalva River to one of the most impressive geological wonders of Chiapas. Towering cliffs, dense jungle, mysterious caves and deep waterfalls offer a hint of what awaits you downstream at Sumidero Canyon. Continue on to San Cristóbal de las Casas, a town of cobblestone streets and red-tile roofs set amid pine-filled forests in the rugged Chiapan highlands (B). Take a morning stroll through the city’s narrow winding streets and beautiful colonial buildings, before embarking on your private tour to intriguing Mayan villages nearby. Witness the extraordinary blend of Catholicism and local Tzotzil practices in the famous church of San Juan Chamula. Then, onwards to Zinacantán where women use centuries-old techniques to transform a whirlwind of colours into rich textiles (B). Journey to two jungle-swathed Mayan cities. Marvel at incredibly preserved painted frescoes in Bonampak, which means “painted wall” in modern Mayan. Continue to Frontera Corozal and board your vessel to the Mayan city of Yaxchilán. Here, intricate structures, hieroglyphs and inscriptions narrate the city’s history, while howler monkeys look on from the trees (B,L). Venture deeper into the jungle to where one of the most notable city’s of the Maya Classic period once reigned. Unravel the myths of the Maya as you wander around Palenque’s exquisite architecture and decipher age-old inscriptions. Then, travel by plane onwards to Mexico City and soak up the very last of your visit amidst its vibrant nightlife (B). Travel to the airport for your onward journey (B). Revealing a patchwork of stories at every turn, Mexico’s fabled colonial cities will leave you spellbound.